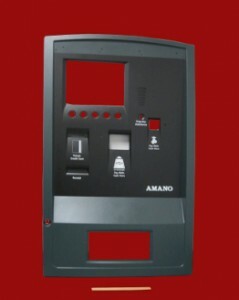 Have you been noticing the enclosures for vending solutions are becoming more stylized, lately? The Reaction Injection Molding process may be a solution for more stylized vending kiosks. Well, it may be a solution if your project is a low volume project, or if you are needing bridge tooling until the volumes begin to peak. So, what is low volume? Typically, our clients require a few hundred to a few thousand parts per year, and they want to keep their inventories low, so we provide them with small batches to help minimize inventory stock. When you review your project geometry are you noticing varied wall thicknesses due to the internal component configurations? Perhaps, your geometry is more complex and you can’t achieve the complex geometry with your current molding process. There is good news, varied wall thickness is a problem welcomed by the “Reaction Injection Molding process”. Since the resins are thin like the viscosity of skim milk, we can completely fill the mold to achieve complex geometric parts.